Generally speaking, men have tighter hips, hamstrings, and shoulders than women, but men also naturally have more arm, shoulder, and thigh strength. While most men struggle with flexibility, the strength factor can drive your practice into a more substantial place more quickly. Here are a few pretty challenging posture modifications, designed for men, to help you stretch out those challenging areas while using (and enhancing) your natural strengths. 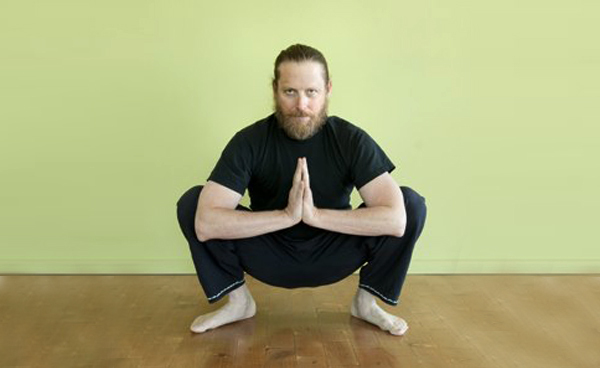 Try out these top 10 yoga poses for men, and let us know how it goes! Strengthen up your core, shoulders and wrists with an extra plank hold after your Cobra or Upward Dog during each Vinyasa. No flexibility needed here! This will fire up most of the muscles you need to warm up in order to stretch out. After your Cobra or Upward Dog stretch come back to your belly and push up to Low Plank for a hold — then High Plank and back to Down Dog. You will naturally have tighter shoulders then the women in your class. That’s OK, just take your arms to a V shape or cactus them around your ears and lift your chest up. Make sure to ignite your fingers so you fire up your triceps. Make it a little easier on your hips and hamstrings by keeping your feet wide, as if they are on railroad tracks. They should be as laterally far apart from each other as your hips. The goal in Warrior I is to get that back leg as straight as possible with the back heel flat on the mat, while keeping your torso completely upright. If your back knee is bent that’s totally fine, as long as you feel a stretch happening (the same is true in Down Dog). This Low Lunge variation opens the front of your hips and stretches your core. Keep pressing your weight forward, maintaining your knee over your ankle, then press the top of your back foot into the mat to lift your back knee. Your hands could be on blocks to start, but aim to have them at heart center so that your arms are not what is holding you up. Hold for 5 breaths then lower down carefully. Tuck the toes so you can press into a High Lunge to stretch out the back hamstrings. This shape does so much for you. It will open the back hamstring, work on your shoulder tightness, strengthen your core and your quadriceps, plus it is great for your back. Keep your knees bent for this spinal stretch, and really push into your arms to break up that shoulder tension. Use a strap in your hands if you are super tight and move your arms slowly up and down from your low back creating an arch. This really knocks out knots and tight muscles quickly. For a little extra push through the hamstrings, you can pause your arm hold somewhere and begin to straighten your legs for a moment — but remember it’s not about getting straight legs, it’s about feeling the stretch. Many men find this much easier then woman because of their natural upper body strength. It is a great hip opener and encourages a deeper Forward Fold without having open hamstrings, so build it into every practice even if your toes never leave the floor. If you have less flexibility in your Forward Fold, try squeezing your knees on the outer edges of your upper arms. They have to be above your elbows, so maybe you work on that for a while before going any further. Later, you can plant your hands flat to the floor and lean your chest forward for the arm balance. 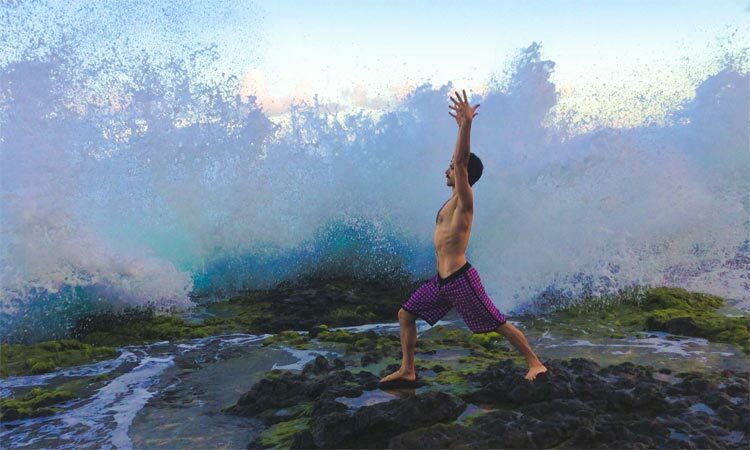 This is Malasana or Garland Pose with a manly difference — your arms are stretched out in front of you to help keep your spine aligned, and thus sinking you deeper. It helps open your hips and encourages those strong leg muscles. Step it up by lowering slowly from standing, hold for 5 breaths, then come back up in slow motion. Fish Pose is a wonderful backbend for guys, because it doesn’t require as much leg or shoulder flexibility as Wheel Pose. The more you tuck your 90 degree, bent elbows underneath you, the deeper the backbend. Take advantage of this spinal opener by adding in some hip flexor strengthening and core work: in Fish Pose, activate your toes and lift your legs in one piece to about 6 inches and hover for five breaths. A simple Bridge Pose is a great option for men who want to open their spines, stretch the quadriceps, and loosen shoulders. Spice it up by practicing lifting to your toes, or squeeze a block between your knees to strengthen your hamstrings and back. Press your hands into the floor behind you in Butterfly Pose and squeeze the shoulder blades together to lift your chest. Stay seated as you press your knees down equally on either side and lift your chest higher. This opens both hips simultaneously with a lateral rotation, getting you ready for Pigeon Pose. So to sum up, men need yoga, perhaps even more then women, and just like any other sport or practice, you will want to use your strengths to help you work on challenging areas. Yoga is about frequency more then anything, no-one got great at football without practice, so stick to it and you will see a difference very quickly.